When you’re looking for Uptime Solutioneering™ to keep your operations running smoothly, there’s only one place to go — C&B Equipment. 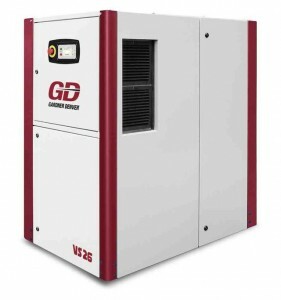 When you’re looking to improve performance while also reducing your impact on the environment, the Gardner Denver™ EnviroAire oil-less air compressor offered at C&B is the way to go! Best matched for sensitive applications in which oil contamination is extremely costly, the EnviroAire series of air compressors offers users a clean, reliable and efficient air supply that benefits both your business and your bottom line! EnviroAire water-injected rotary screw compressors are the true oil-free solution. Unlike many other “oil-free” compressors, EnviroAire packages contain absolutely no lubricating oil. The EnviroAire’s unique design features ensure reliable, trouble-free operation and superior performance. Utilizing the industry’s most proven components, EnviroAire oil-less rotary compressors are not only reliable — they’re highly competitive. All EnviroAire compressors feature durable, twin-gate rotors and a single stage direct driven compression element that was designed for water injection. By using a water-injected design, the gearbox is eliminated which means there is no need for oil lubrication and zero chance of contamination.